Kitten pictures are soooo last year. After the rabbit yesterday I can now proudly present two foxes. 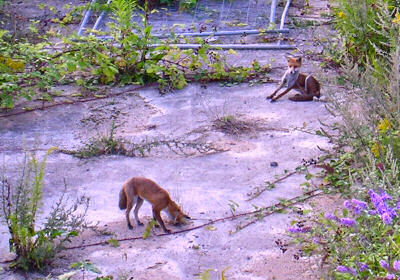 Not sure if they are the first foxes to appear on a weblog, at least they are the first I'm aware of. They seem to live in the area behind my house, I've seen at least one in the area before. Today for the first time I saw three (the third one was out of sight when I took this picture). Foxes are a quite common sight almost everywhere in Swindon, even quite close to the town centre. There's an area of maybe 150 yards by 30 yards behind my house which is kind of a wilderness. It's fenced off from almost all sides (and there's houses and other buildings surrounding it), I believe someone has planning permission to build houses on it but nothing seems to have happened since I moved here in 2000 (except for a new fence being erected two or three years ago on one side of the area). For the time being it's wasteland and the foxes seem to like it there.